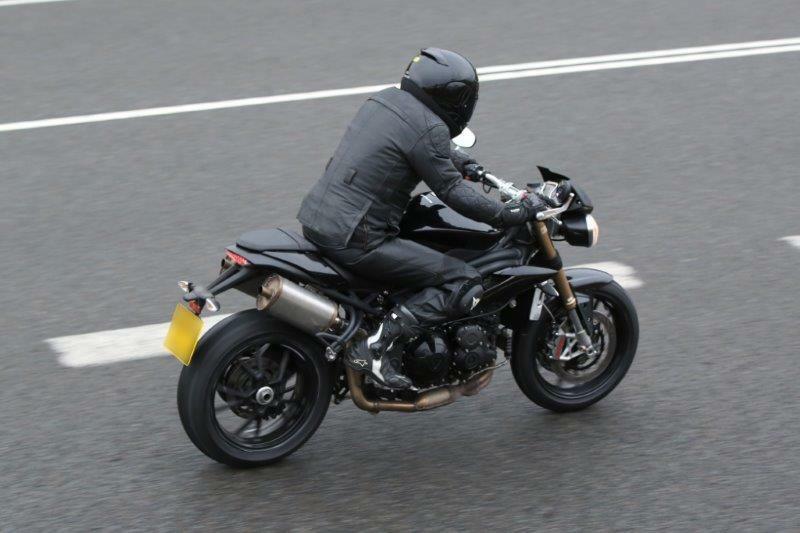 The new bike features a raft of changes the British firm will be hoping will be enough to keep the Speed Triple and higher-specification Speed Triple R able to fend off the competition in the naked bike class. 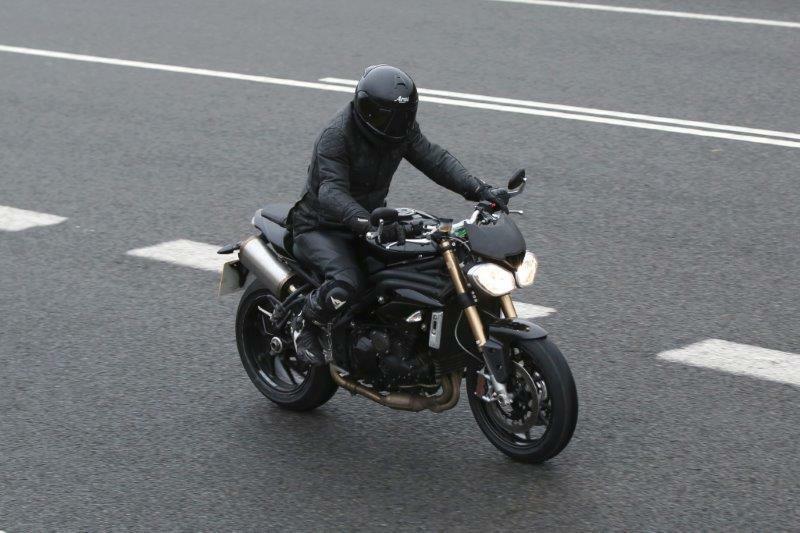 The Speed Triple range can be directly traced back to 2005 when a slightly different bike was launched. Since then the bike has seen mild tweaks and changes while all around it the naked bike class has been evolving. MCN’s road testers still rate the Speed Triple as one of the best road bikes in the class; its lack of power when compared to 160bhp bikes like the class-leading BMW S1000R. The three-cylinder engine has fantastic road manners and an engine note that still finds fans and for many the lack of electronic riders aids (apart from switchable ABS) appeals to many. What we can see is a bike that has been given a set of styling and engineering tweaks to freshen up the design of a bike that can be traced in almost every regard back to the bike that was launched in 2005 and has barely been changed since. It appears this bike is the standard Speed Triple model but has been given a specification upgrade in terms of the brakes with the fitment of the Brembo brakes from the current R model to replace the lower specification Brembo radial calipers. The Showa forks from the standard bike are still in place. We don’t really know the exact details of the specification changes we can see here because this bike is still 18 months away from being officially revealed MCN understands. This gives Triumph plenty of time to work on the smaller details and motorcycle firms often use a mish-mash of parts while bikes are testing as they are simply the ones that are at hand and fit. One of the biggest changes to the bike remains one of the most mysterious in the form of the centrally-mounted air intake above the twin front lights. We can definitely see Triumph has added a ram-air system to the 1050cc three-cylinder engine and this would only have been done to boost power and overall efficiency. The ram-air scoop can be seen to run from above the front lights and then into a new headstock casting section which then attaches to the existing frame design. This is a cost-effective way of boosting power to the engine and only making the minimum of changes to the bike to allow the routing of the ram-air scoops. Triumph never comments officially on spy shots taken of bikes before official launches so we can only estimate what improvements to power and torque can be expected but we reckon on power going up to around 140bhp from the current 133bhp with a corresponding lift to around 85ft lbs from 82ft lb currently. 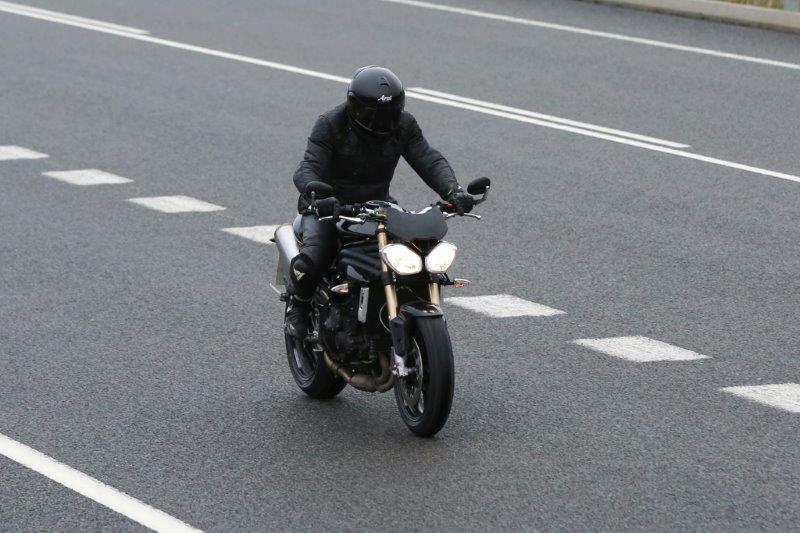 The importance of any changes to the Speed Triple cannot be overstated for the British firm because the bike remains a big seller. In light of this it’s not hard to see why Triumph is apparently not making huge changes to the bike but the conservative nature of the tweaks to the bike may disappoint some who have been hoping for a much more radical overhaul. Triumph insiders have told MCN this bike is an interim machine to tide the firm over while it works on a completely new bike which is many years away from showrooms as it has only just been started. Triumph has recently moved to refocus the work it is doing on the core of motorcycles which have come to be so integral to the modern history of the firm owned by John Bloor. Triumph has officially stopped work on a new single-cylinder 250cc range of bikes and has also recently closed a separate off-shoot called Trident Powersports which, after years of work, had now ceased to exist and all work in setting up a leisure sports division has been canned. 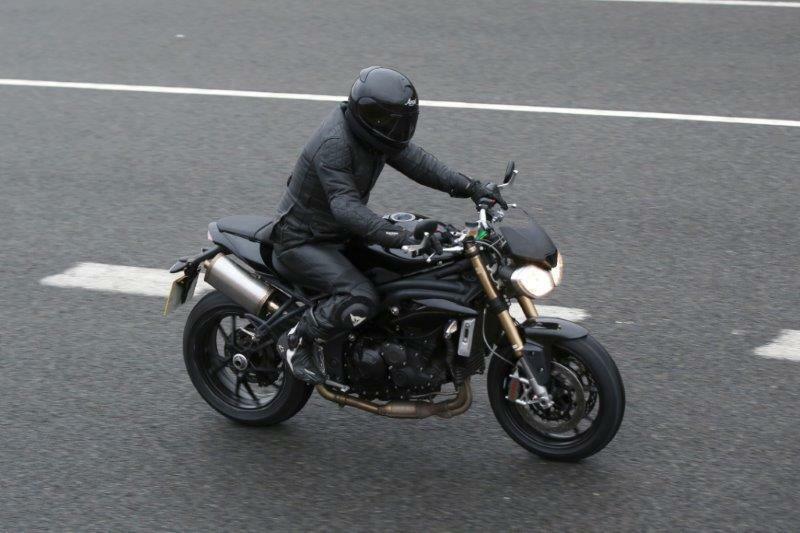 MCN understands a lot of work is underway at Triumph to give the current range of motorcycles a complete modernising overhaul and the Speed Triple, along with the smaller Street Triple is going to be integral to that but we understand this bike will be revealed in finished form towards the end of 2016 for a 2017 model year release. Before this bike comes along there will be an anniversary model launched called the Speed Triple 94 which will celebrate the 20 years since the bike was first launched. SEAT UNIT: The plastics on the side of the seat unit have been modified to give a more pared back look which is in keeping with the other styling changes made to reduce the visual bulk of the bike. FRONT BRAKES: This X-shaped brake caliper mount is the same as the one that holds the current Speed Triple calipers but the calipers have been upgraded to the same ones fitted the current R model. This suggests the R model may get even more high-specification brakes; possibly the M50 Brembo caliper as seen on the likes of the Ducati 1299 Panigale. CENTRAL AIR INTAKE: The flyscreen is new and now has what looks like a ram-air intake mounted at the bottom which could well be a way Triumph is aiming to boost the power from the 1050cc three-cylinder motor in an attempt to tackle more powerful rivals. RADIATOR COWL: Once again a neat styling trick of trying to reduce the overall bulk of the bike can be seen in the form of these new radiator side cowlings which are much slimmer. EXHAUST: These are clearly not the final production versions of the twin exhausts which are going to on the finished bike but despite the rough finish (and the missing end caps off the silencers) the exhaust system doesn’t seem to be that different from the current bike but will almost certainly be lighter. ENGINE CASES: MCN insiders have cast serious doubt on the updated Speed Triple range getting a whole new engine - despite growing calls for more power but the engine cases can be seen to be new and the subtley different castings give the engine a fresher and more technical appearance and there is space for the triangular Triumph logo. NUMBERPLATE HANGER: The fairly mild but wide-ranging mods to the bike are perfectly illustrated by the new numberplate hanger which is different to the existing bike but hardly radical.